There were fantastic results from various match centres across the nation after nine Match Day 2 encounters were conclude, on Wednesday. While we still await the outcome of the duel between El-Kanemi and Wikki Tourists in Maiduguri, on Thursday, Plateau United and Abia Warriors have since emerged as pace setters. Both sides are placed first and second respectively, with same number of points. The match between FC Ifeanyi Ubah and MFM turned out to be the biggest win for the day after the Anambra Warriors battered their visitors 4-0. Three goals came in the first forty-five minutes of the event and the last goal, which came from a set-piece taken by charismatic Ifeanyi Onuigbo. It was his debut and Onuigbo made it special. First half goals from Ivorian Yaya Kone, Nigeria International King Osanga and youthful Jimoh Oni, kept the Nnewi fans lively and cheerful for the entire duration. Apart from raining in goals, FC Ifeanyi Ubah displayed a commanding style of football and obviously had greater possession of the ball at every point in the game. It was a day the trio of Kone and Osanga scored on their home debut. The damage was done with four goals, but it could have been more. Kano Pillars visited Makurdi as guests of Lobi Stars and the left empty handed, losing 1-0 to the Pride of Benue. John Lawrence was on hand to keep a clean sheet for his side and their opponents’ defense manned by new signings: Udoji and Anyanwu could not contain the attack of Lobi. In Gombe, it was Remo Stars who came to the big party first, opening the score line, but could not sustain the lead as Gombe came from behind to win 2-1. Abia Warriors maintained their decent start in the campaign with a comfortable home win. Still basking in the euphoria of the away victory over Oriental brothers, they eased past Katsina United by 2-0. The newly promoted side’s visit to Umuahia was not fruitful. Rangers were fortunate in the early minutes of their encounter in Lafia against homers, Nasarawa United. Fortune Omoniwari opened the score line, which was his second goal in his second outing for Imama Amapakabo’s side. 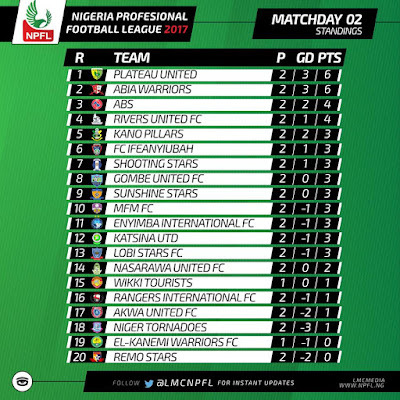 The encounter, however, ended in a draw, which means Nasarawa United have garnered 2 points from two matches, while the Flying Antelopes have one point from same number of games. In Jos, a consolatory goal for Enyimba came in the late minutes by midfielder Ibenegbu Ikechukwu, as the Kennedy Boboye led side carried the day: 3-1. This result puts the Jos based side at the top of the log, thanks to their three points from Sagamu against Remo Stars in the league’s opener. 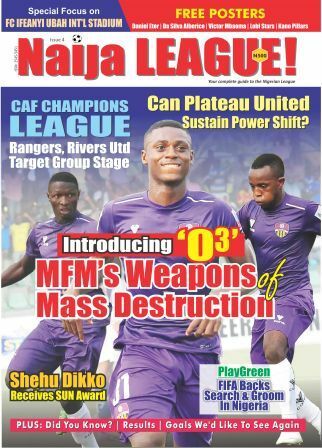 Niger Tornadoes could not compensate their fans after losing 3-0 against MFM FC in the opening game. The Ikon Allah boys were held to a 1-1 by visiting ABS of Ilorin. Abdul Maikaba’s lads entered the fray at the Nest of Champions following a defeat in the opening game, but a disappointing draw for the Uyo based side ended the day. Goals by Cyril Olisemah and Bernard Ovoke settled the cracker between the south-south clubs. In the south-west derby, the Akure Gunners were 1-0 winners over bitter rivals, Shooting Stars, as a 78th minute strike by Sunday Oluwadamilare made the difference in the first meeting of the two sides this term.